The Modern Foreign Languages department at Christ’s School aims to inspire a love of language learning and an awareness and acceptance of different cultures. The department is well-equipped with the latest text books and subscriptions to a number of online language sites. The department often makes use of the library and computer rooms to support the students’ learning. The department organises a number trips to France each year. For pupils studying French in the Sixth Form we are organising a work experience exchange with our link schools in Le Havre. The pupils will work as foreign language assistants for a week and stay with their exchange partners. We also take pupils on trips in this country such as to the British Airways languages centre at Heathrow and to courses put on by universities and the French institute. All the trips we organise are very popular with our pupils and have a very positive impact on their learning. It’s possible to study modern languages either as a single honours degree or alongside another subject as a joint honours degree. 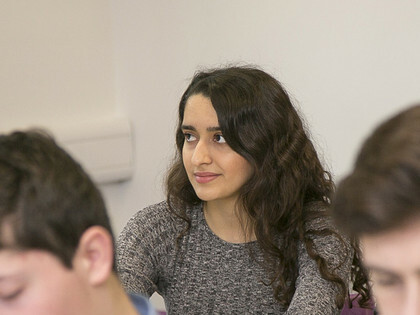 Common joint honours choices often remain within the humanities, including subjects such as politics, history and literature, but modern languages can also be combined with subjects such as chemistry or mathematics, for those wishing to keep their options as broad as possible. A language degree can qualify graduates to work in education, translation, interpretation, tourism, trade, PR, communications and management. Many government jobs require language skills, particularly in the sectors of immigration and diplomacy. All sorts of career destinations- doctors, psychologists and physiotherapists need language skills to communicate effectively with patients whether they work in the UK or overseas; businessmen, bankers and entrepreneurs all need language skills to make deals and sell products on the global market. Politicians, historians, geographers and holiday reps all need language skills to get to know the people and area that they are passionate about. Languages are an invaluable skill to have. Studies show that having a language can increase your salary from 8 to 20% and give you a head start on other potential employees as by speaking another language you’re vital to any company that does international business. Furthermore a language is also a prerequisite for lots of university courses.